Line installers and repairers are the technicians that repair telecommunication lines as well as electrical power systems. These technicians are highly skilled tradesmen and need to undergo fairly significant training in order to progress throughout their career. The industry of line installation and repair is growing at a relatively fast pace, and it is anticipated that the next decade will bring with it 36,200 jobs across the nation. According to the Bureau of Labor Statistics, the median pay of a line installer and repairer is $54,290 or $26.10 per hour. Line installation and repair is an excellent choice for someone who is interested in devoting themselves to a career but does not have a formal education. A line installation and repairman is only required to have a high school diploma or GED to begin his training, though preference may be given to those that have at least two-year degrees in a related field. Overall, the field may require physical labor and it may be demanding of time. However, it can also be an extremely rewarding field that offers a lot of mobility. The work of a line installer and repairer is fairly diverse. Often they will need to run, repair and replace telecommunications cables, which includes fiber optics. This is very common, as many new installations of fiber optics are being completed every month due to the internet industry. Electrical installers will usually have a different set of concerns and tasks, as electricity can be very difficult to deal with. Skilled technicians may work for the government or private electrical companies to string the lines between power poles or other structures. Line installers and repairers may also need to climb transmission towers or poles, which requires extensive training and the following of safety protocols. Line installers and repairers will need to become acclimated to a diverse set of tools, and they may also be called upon to operate heavy machinery and power equipment as is necessary. Overall, the position requires skill, knowledge and dedication. 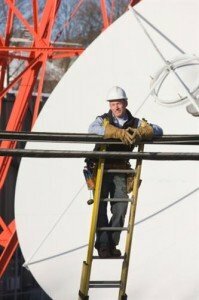 Telecommunication installers may be required to test lines and may need to drive work vehicles. They may also need to set up the service for a customer as well, if they are working for an internet company or telephone company. How Do You Become a Line Installer and Repairer? Becoming a line installer and repairer is often as easy as getting hired by a company that provides this service. Once this has been done,t he company will give the new hire on-the-job training suitable to do the job. There are 2-year and 1-year certificate programs that will allow a line installer and repairer to learn more about the industry. Those that are involved in electrical repair will often need to go through a formal apprenticeship, at the end of which they will become a journeyman and continue to progress in rank. Those that work for telephone and internet companies usually need no such formal training. How Do You Advance as a Line Installer and Repairer? Line installers and repairers can consider moving ahead within the company or transitioning into something a little more complex, such as network administration and installation. Those that work with electrical lines will often progress based on seniority through the union, and will see increased pay and benefits throughout their time with the union. Line installers and repairers that work with cable and internet companies usually don’t make as much as electrical installers, so they may wish to advance by transitioning to electrical installation and repair. According to O*Net Online, one of the related fields that has the brightest outlooks is security and fire alarm system installation. This is another job that a line installer and repairer may be considered qualified for.